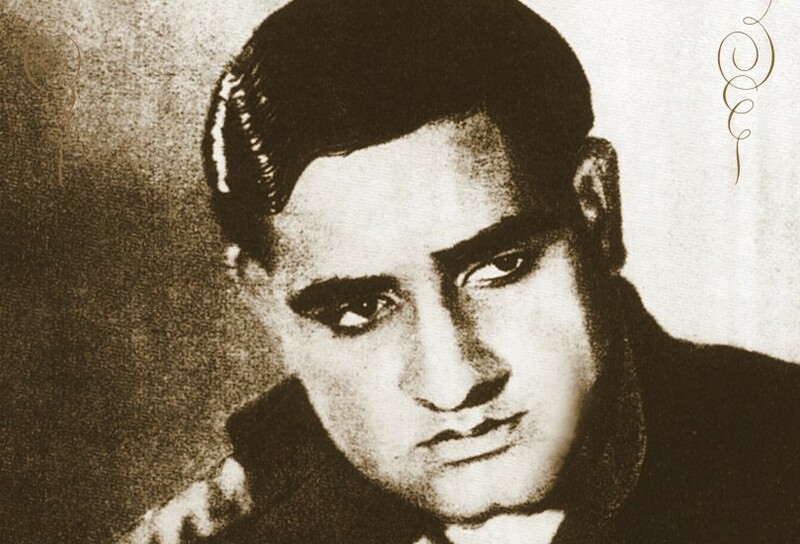 Kundan Lal Saigal was really the first male superstar of Indian Cinema,a phenomenal singing star in the 1930s and 40s. Though not conventionally good-looking and balding (in fact he always wore a wig to cover his baldness), people responded to his everyman demeanor and of course, to that magical voice…even when articulating dialogue. Saigal was born in Jammu on April 11, 1904 and as a child, occasionally played Sita in the Ramlila of Jammu. His only formal training apparently came from a little known Sufi peer, Salman Yussuf. The singing tradition he assimilated had little classical rigour but emphasized the poetic blending of syllables into musical forms like the thumri and ghazal. His renditions of Mirza Ghalib’s poetry and his identification with its tragic iconography helped greatly to form his famous persona. A school dropout, Saigal worked first as a railway time-keeper and then as a Remington typewriter salesman before BN Sircar recruited him at New Theatres, Calcutta. Saigal’s style was substantially shaped at New Theatres by stalwarts such as RC Boral, Pankaj Mullick and Timir Baran. He was launched as a singing star with Mohabbat ke Ansoo (1932) but it was really with the success of Chandidas (1934) that he became a star. The following year saw Saigal reach the very top with his career-defining role – the title role in Devdas (1935) directed by PC Barua. The film was a triumph for Saigal and took him to dizzying heights. Saigal brought alive the character of Devdas creating the archetype of the relentlessly luckless, tragic hero. His brooding looks, the vagrant lock of hair, the resonant voice filled with love and despair drove the nation into a frenzy. His songs in the film Balam Aaye Baso Mere Man Mein and Dukh Ke Ab Din became smash hits. In the latter song, Saigal obliterates the artificial barriers that separate prose, recitation and song as he breaks the melodic progression of the song by laughing bitterly at his own squalour. In fact, to many old-timers Saigal remains THE definitive Devdas even though the role has subsequently been played by such thespians like Dilip Kumar, A Nageshwara Rao and of course, Shah Rukh Khan. Saigal was fortunate in that he worked for an institution like New Theatres. Known for their quality filmmaking, Saigal featured in many of the studio’s masterpieces – Didi (Bengali)/President (Hindi) (1937), Saathi (Bengali)/Street Singer (Hindi) (1938) and Zindagi (1940) among others. In Street Singer, Saigal’s rendition of Babul Mora was done live in front of the camera. Though playback had come into vogue by then, he nevertheless convinced director Phani Majumdar that he would do a better job live in front of the camera. Thus Saigal ‘walked the streets’ in the studio singing Babul Mora, with the entire orchestra following him out of the camera’s reach. The result was magic! Seeing the popularity Saigal had, Sagar Movietone launched Surendra as an answer to Saigal and though he had a distinguished career of his own as a singing star, let it be said – Saigal was still Saigal. In the early 1940s, Saigal moved to Bombay working with Ranjit Movietone. Bhakt Surdas (1942) and Tansen (1943) were his big hits at Ranjit and consolidated his popularity. The songs of Tansen, in particular, are resplendent in their royal glory. The film successfully shapes the classical and semi-classical thumris and dadras to the need of cinema. And above all, the film is still remembered for Saigal’s astonishing rendering of Diya Jalao in raag Deepak. Saigal returned ‘home ‘s New Theatres to do Meri Bahen (1944). The film is technically one of Saigal’s best films at New Theatres and was known, of course, for its music with songs like Do Naina Matware and Ae Qatib-e-Taqdeer Mujhe Itna Bata De. However, alcohol was by now fast overtaking Saigal’s life. It was said he could only sing only when fortified with liquor. His health began failing. A last ditch effort at abstinence proved useless as he was too far-gone and on January 18, 1947, Saigal passed away in Jullunder. But not before giving us such melodic gems like Mere Sapnon Ki Rani, Ae Dil-e-Bekaraar Jhoom, Jab Dil hi Toot Gaya – from Shah Jehan (1946). Saigal’s last film was Parwana (1947), one of three films he did with singer-actress Suraiya, the others being Tadbir (1945) and Omar Khayyam (1946). Such was the power and mystique of Saigal’s singing that singers like Mukesh and Kishore Kumar started their careers singing in the ‘Saigal style’ before etching out their own identities.